Film Review : The man who killed Hitler and then the Bigfoot. That day, I just killed a man. What he stood for was unstoppable. The absurd title alone should stimulate your curiosity. A film with such a whopper of a title (sounding completely absurd) can only lead to an unrivaled experience. My first reaction was: “Only Monty Python can come up with such a film title.“. 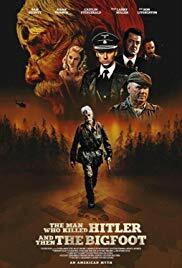 I found “The man who killed Hitler and then the Bigfoot” a relief, after seeing so-called masterful films that should be breathtaking but ultimately were disappointing. More and more I come to the realization that mainstream films appeal to me less than those that can’t be seen in the commercial circuit. What stays in my mind after watching “The man who killed Hitler and then the Bigfoot“? Firstly, the makers of this wayward film created a myth on the one hand. And on the other hand, they eliminated a myth. Secondly, Sam Elliott, besides being the owner of an impressive walrus mustache, also knows how to act. Nothing new I’d say. And now he has an Oscar nomination. That has taken way too long. And finally, the question that gnaws at my soul. What was in the box? And what was in Calvin Barr’s shoe and bothered him the whole movie? No, it’s no violent B-movie with an absurd storyline. It’s already clear to the attentive readers. This isn’t an average film that was created for the general public. And even though the two main subjects are earth-shattering (if they would be true) and absurd at the same time, there are also secondary subjects beneath the surface that are just as important. Subjects that deal with regret and musing about a life course and whether or not it could have been different. And also about handling traumas and neglected family relationships. And finally losing an old love. It’s all included in a subtle way. Even though the film title seems to indicate that you are going to see some obscure, modernist film experiment with cheap violence and an absurd storyline (it also reminded me of Craig Moss and his absurd movie titles), it all looks very different. And surprising. Perform one bold task, and surely they’ll ask you again. It’s all about Calvin Barr (Sam Elliott). A veteran who has done something specific in WWII that would normally have to be very far-reaching and had to change world history. Only his assignment, well prepared and successfully executed, didn’t appear to have the alleged effect. Apparently, it seems to have something to do with covering it up and secrecy. His reputation, however, ensures that he’s once again being asked by the secret service to carry out another ultra-secret mission nobody will probably know anything about afterward. Such an assignment that undoubtedly will grow into a myth. And in the end, people will start guessing whether or not it actually happened. Eliminate someone you hate versus losing someone you love. Maybe this is what’s weighing on Calvin. The lack of any appreciation for his actions and an official tribute for what he had done for mankind. Either the realization that his actions ultimately didn’t make any difference. That’s why he’s not interested in the question asked and he gives an explanation about how crooked thoughts and ideas continue to exist. Even after eliminating the person who spread the ideas. And probably the thing that bothers him the most, is the fact that the mission to eliminate the person, who’s a threat to world peace, has ensured that the person he loved the most, slipped through his fingers. Sam Elliott is an icon. Undeniably, the interpretation by Sam Elliott is simply sublime. His appearance and facial expressions definitely are the cause of this. Something Krzykowski took advantage of extensively. So you can expect a lot of close-ups where you get to see his steely eyes glancing over his glasses. A rough appearance with bushy eyebrows and a gigantic gray walrus mustache. He’s such a man who has had a richly filled life that he thinks about and reconsiders. But he’s also a man of age who has to take his pills every single day, who falls asleep in front of his antique-looking television and who asks his old dog how they’ll get through the day. A character face with a unique, deep voice. Wonderful acting by an icon in filmland. But also the acting of Aidan Turner as the younger version of Calvin is pretty decent. The frequent flashbacks that occur in the film show Calvin’s comings and goings. Flashbacks that suddenly pop up when the mind of the older Calvin wanders. We see the somewhat timid seller of hats who falls for Maxime (Caitlin FitzGerald). A rather clumsy person who doesn’t succeed in popping the question. Bringing a marriage proposal to a successful conclusion seems to be extremely difficult for him. In fact, the parts where Aidan Tuner appears in, are the funniest parts. The awkward and embarrassing dinner. And the scene when he arrives at the headquarters of the Nazis is utterly hilarious. A must see? Once again. No, “The man who killed Hitler and then the Bigfoot” isn’t only a movie about a hero and his heroic deeds. And even though the title is literally what’s going on in this film, it does not cover the subject completely. The title would be more complete with “… and gained nothing with it.” because on both missions, Calvin actually lost something. But then the title would probably no longer fit on the poster. I just thought it was a fascinating film. A film about absurd facts of mythical proportions. Or maybe not? Sadam Hussein also had a bunch of doppelgangers. And no one could ever prove the Sasquatch does NOT exist. That’s why those are a myth. I was left with only one burning question. What the hell was in that wooden box and Calvin’s shoe? Some good advice. Go watch this movie. And when you’ve done that, could you please answer my question?